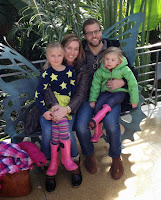 It's a first here on Designing Domesticity - we are featuring a third post from one of my all-time favorite guest posters, my dear friend Katy from Chicago. 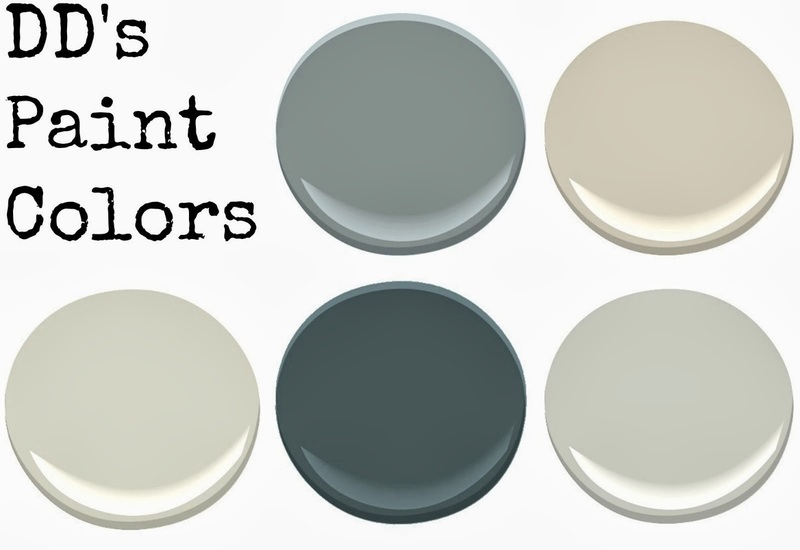 You may remember her collections post and her eat in kitchen banquette post. Katy has amazing style and every home I visited of hers over the years has been impeccably impressive. That's why when I learned she was taking on another big project in her newest home, I immediately asked if she'd be interested in sharing it here. Fortunately, for all of us, she said yes. I’m due with baby number 3 in December and we needed to make room for him. We have two daughters and four bedrooms, but didn’t want to give up our guest room/ office. Since our oldest daughter had the biggest bedroom in the house, we decided to move her sister in with her so the baby could have her old room. Sounds easy enough, right? Then you mix in the emotions of pregnancy, and I have to say, they held me up a bit! Here we are expanding our family and already ruffling the feathers of our two great girls. I love any opportunity to decorate, but had some emotions to overcome about moving them in together. The room was big enough, but my courage lacked. 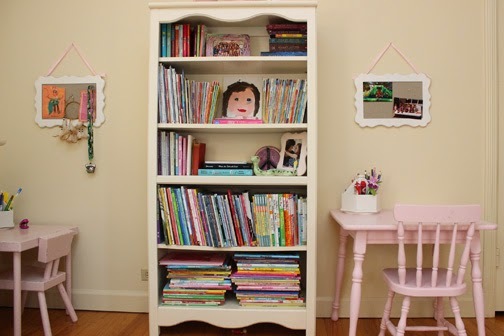 Both girls were losing their own bedroom due to this change, and I was sensitive to that… So, if we were going to do this, I HAD to make it special. An improvement. Something to get excited about. For my 5 year old, Charlotte? No problem. She was going to bunk up with her big sis? And get a bigger bed? How soon can she move in?! My 8 year old, Gracie, agreed but was not in any hurry. I understood, and had to make this special - for her too. My other requirement? Not breaking the bank. I had lots of working pieces from both of their (finally decorated, of course) rooms, so I needed to consolidate and make it work. 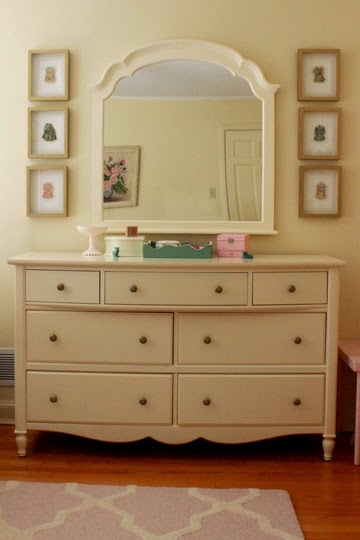 I had from their rooms, and needed to use: curtains, a dresser, bookshelf, nightstand, and things on the walls. 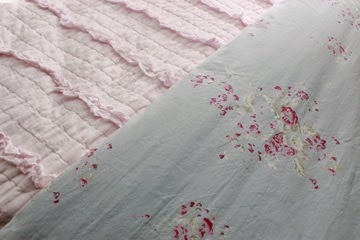 And a pink rug that I had recently purchased and insisted on making work. The girls’ only request: blue bedding. I started with the beds. I was only slightly disappointed to find out that I couldn’t just purchase a second bed to match Gracie’s bedroom set since it was discontinued, because... 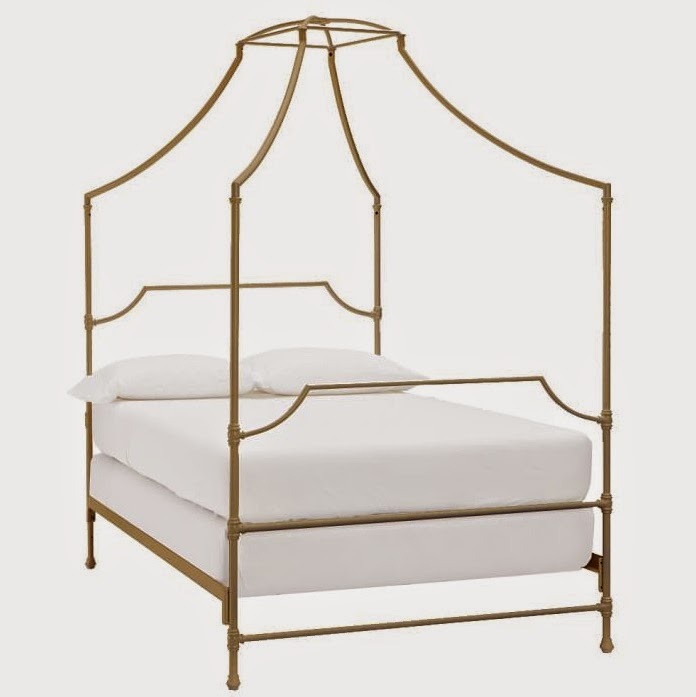 Truth be told, I already had fallen in love with the Maison Canopy Bed from Pottery Barn Teen. I wanted beds that could go with the existing matching furniture pieces. This bed was unique, and I loved the brass! I also loved that the bed’s style could define a space for each of them. If they had to be in one room, these beds could still give them the feeling of their own defined space. Could I pull off two of them? That was the big question. I drove to visit them in the store, debated for weeks, finally convinced myself I would make them work, and placed my order. Soon after, I began to look for bedding. Target’s Shabby Chic line has been around for a while and I’ve always liked the style. But, when I stumbled across their adorable pink ruffle quilt (that would match the curtains I already had in the room) and - what do you know, A BLUE flower duvet cover! - I actually avoided buying them because it seemed too easy! To make my life more difficult, I continued to shop for other options. Finally however, I decided that at Target prices, I was being silly and bought them both. 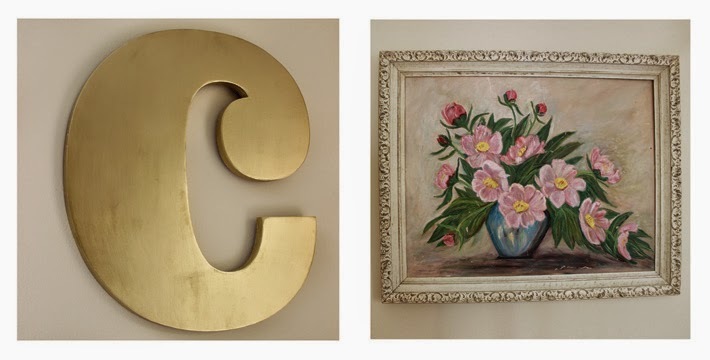 After grabbing some of my favorite things from Charlotte’s walls - her “C,” and flower painting - I began to fill the space. 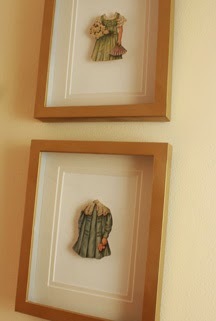 I had framed these paper doll dresses and they hung in Gracie’s room originally. Had to keep them. 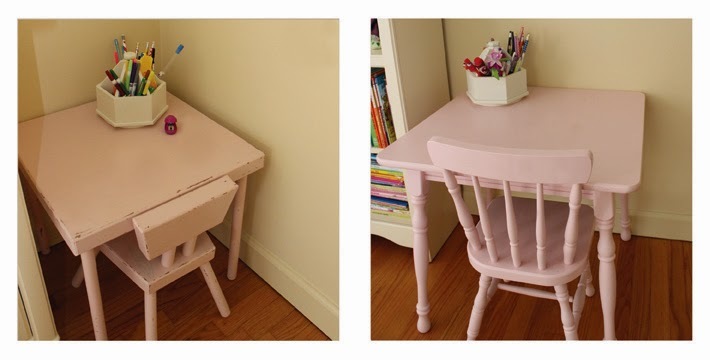 I also moved in Charlotte’s little pink table. Gracie had one, so I figured Charlotte’s should squeeze in too. The good thing about all of this? They were all things I had. They didn’t cost me a dime. As well as being things I loved. Special. As always, the lighting became icing on the cake. Since I had saved some money here and there, this room deserved the finishing touch. 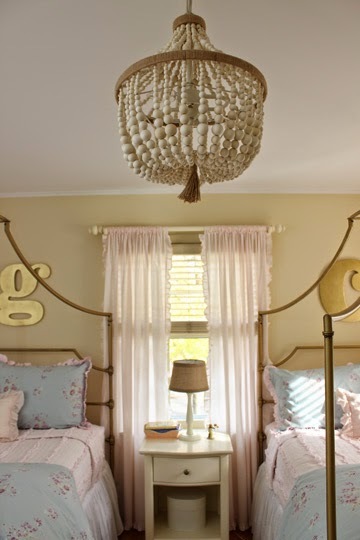 The Dahlia Chandelier from Pottery Barn Kids was it. I’m not one to splurge, but this was worth it. When lit up it makes the room feel fancy. Something to be excited about. The girls moved in together in early October, and all is going well. I love it, and so do they. Both of them. They play "school" at their tables, have goofy conversations before bed, and are actually letting one another sleep in the morning. I have to say, I think it's actually an improvement. Mission completed. I think this room does just what I wanted it to do: Makes them feel how special and important they are to me. During this time of change for everyone, I'd say we're off to a good start. Thanks Katy! 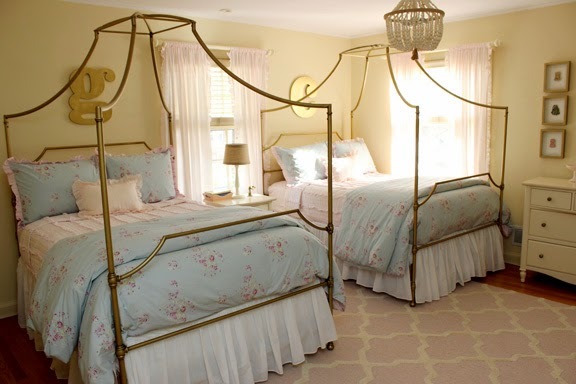 The room looks amazing and I love the beds. Those are two very lucky little ladies! Hope everyone has a great holiday week and we'll see you back here on Monday. Happy Thanksgiving!